When the GDPR comes to an internet connected fridge near you…. This fall my Measure Your City sensor hub fell out of a tree during a storm. It seemed to be damaged, so I put it aside until I could think how or when to reinstate it. Later on I noticed from the log files that it seemed to have stopped working before it fell from the tree but I did not think it important. A few weeks ago I handed the sensor hub in with the team of Measure Your City that does repairs. It turns out the sensor hub was fully functional except for …. the batteries. The problem was the firmware using too much battery power. Which is problematic given the stated aim of these LoRa sensors, to work on low power for a long time. With a firmware upgrade and fresh batteries, the sensor hub is now back in action. The past day I’ve used it to measure the relative humidity in various rooms around the house as we suspected it might be too dry (it was, around 30-35% humidity). As there are 2 similar sensor hubs nearby, we are not without info on current outside conditions. I’ll reinstate the sensor hub outside again this weekend. Meanwhile my own sensor hub as well as the two others a street away, use my recently installed The Things Network gateway to transport the data to the Measure Your City back-end. The gateway also sees several other sensors sending data through the gateway, although I don’t know what type of sensors those are. 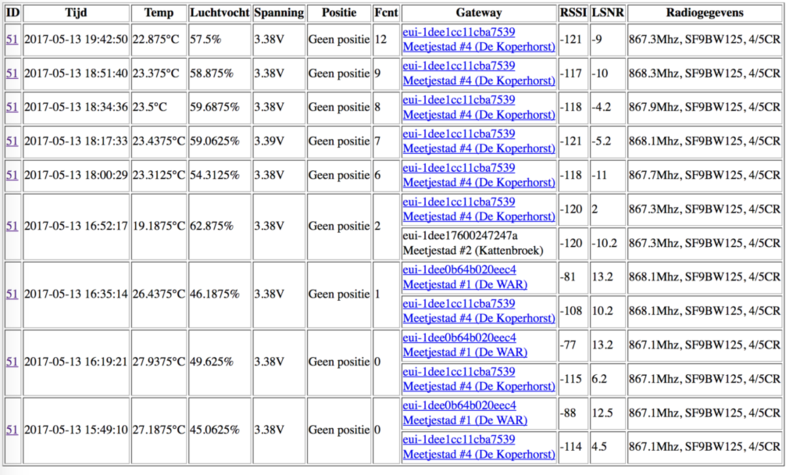 Screenshot of the data passing through the gateway. The device in the first line is my own sensor hub. After receiving the hardware for The Things Network, I now activated the gateway. I had first planned to run up a Cat6 to the top floor but I couldn’t successfully get the cable through the empty conduit that was available for that. Deciding not to wait until I get a cable through the conduit, I connected the Gateway to an ethernet port on the Netgear Orbi satellite that is installed on the top floor. This means it has a steady internet connection, even if not directly wired to the router yet. The first few messages were sent, so now that ‘hello world’ is behind me, I am curious to see if there will be any traffic my gateway sees passing by. 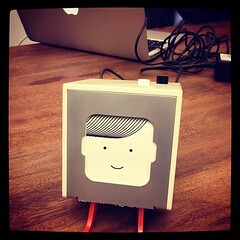 A little over 2 years ago I backed a Kickstarter project The Things Network. It’s an order of magnitude cheaper version of a gateway for a LoRa (long range) network, for internet of things sensors etc. The fascinating thing about this The Things Network gateway is that it provides an infrastructure for very little money. With just 2 or 3 of these your entire city becomes your sandbox for IoT experiments. Usually it’s the other way around: you have cheap prototypes but to scale you need expensive infrastructure (a prototype car is fun, but also having to roll out a road system isn’t.) Now you are just as easy rolling out the infrastructure, as well as your prototypes. It took a long time to arrive. The original team I think learned the hard way that setting up production and supply chains for hardware from scratch has a quite different dynamic compared to software development. This is not a new lesson for Kickstarter projects either. So the hardware which should have been delivered in June 2016 took until January 2018, some 18 months of delay. But now it’s here. In the mean time I’ve co-initiated an IoT community in Enschede (community site here), before moving house to Amersfoort where another group is active. 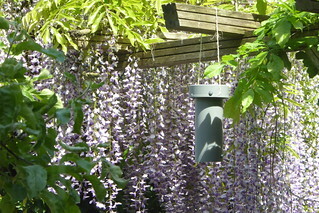 Here in Amersfoort I participated in the Measure Your City project, by placing a IoT sensor hub in my garden. With the hardware now arrived, I can’t wait to start experimenting. My gateway will come on-line as soon as I have run up a Cat 6 cable to our attic space, and can then help support the Measure Your City network, and any other projects that might take place in the vicinity. I’ve backed the Kickstarter project Point. 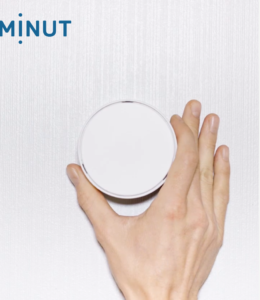 Point is a device that on the front-end, in your home, works as a sensor hub and alarm. At the back-end it feeds a machine learning database that learns your patterns, and shows them to you over time. The whole set-up can be controlled by an app (both iPhone and Android). An API is provided, and it can also talk to IFTTT so you can connect your own triggers and devices if you want (and I do). Point is an existing product, and this Kickstarter is meant to collect pre-orders for the second generation device. The company behind Point is Minut based in Sweden and China, and they state they take privacy protection seriously. It delivers on this, the company says, by doing a lot of the sensor signal processing locally in the device, and then only forwarding exceptions or events of interest (sudden sound e.g. in dB, though not the sound itself) to the centralised database at Minut. Traffic is encrypted, though the owner of the device has no posession of the keys. So in the event that the company should close up shop, there is the risk of having 4 smart but bricked devices, because there would be no way to read out the data it is sending, nor redirect the data to another database for instance. Given they’ve been around since 2014, this is their second run (and they know all about production and supply chains already) and that Thomas is now an investor and advisor to them, is reassuring. Hopefully over time they realise that true privacy also means I should have full control over how and where the traffic gets send, even if it means foregoing their entire back-end service. By the time the devices get delivered (May, so likely just in time for the Stuff That Matters 2018 Smart Homes unconference), I intend to open a discussion with them on those ‘privacy by design‘ aspects. Now that we moved from Enschede to Amersfoort two weeks ago, we are starting to participate in local activities. Today I joined a workshop to build a sensor-hut for the ‘Measure your city‘ project. Initiated by amongst others ‘De War‘, also the people who started FabLab Amersfoort, it is a project to crowdsource measurements to track climate and climate changes inside the city. The national metereological institute does not measure inside cities as it does not provide data that can be compared with other measurements across the country. By building a dense grid of sensors across the city it becomes possible however to track the emergence of ‘heat islands’ or see how paving over gardens or making them greener influences the city’s microclimates. The sensor-hub I built this afternoon is based on Arduino, and uses LoRaWan, by means of the The Things Network, to communicate. 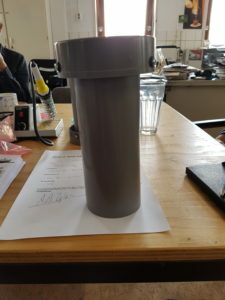 It currently holds sensors for temperature and humidity, but is prepared to also measure sunlight exposure, rain fall and soil humidity / aridity. It also has a GPS antenna, to capture the location of the device correctly. It had been a good while since I last handled a soldering iron, but following the ‘fit for all’ building instructions after a while I ended up with a ready device. After loading the right software, it became sensor 51 in the Measure Your City network. The second stage was building a hut for the sensor device, so it measures adequately: shielded from direct sunlight, with air allowed to float around it. This so it matches up with the standards that normal metereological measurements adhere to. After a few hours me and half a dozen or so others had their own sensor-hut to install at home. I haven’t properly installed the device yet: the hut still needs a white coat of paint to reflect sunlight, before mounting it in our garden at about 2 meters height. It is already taking measurements however, and it can be followed through the online database of the network’s measurements. If you look at the current data for my sensor 51, you see it also hasn’t measured its location yet. If that persists as I properly mount it outside, there might be something wrong with the GPS antenna. The temp readings are still in-house readings, and do not reflect outside temperatures. 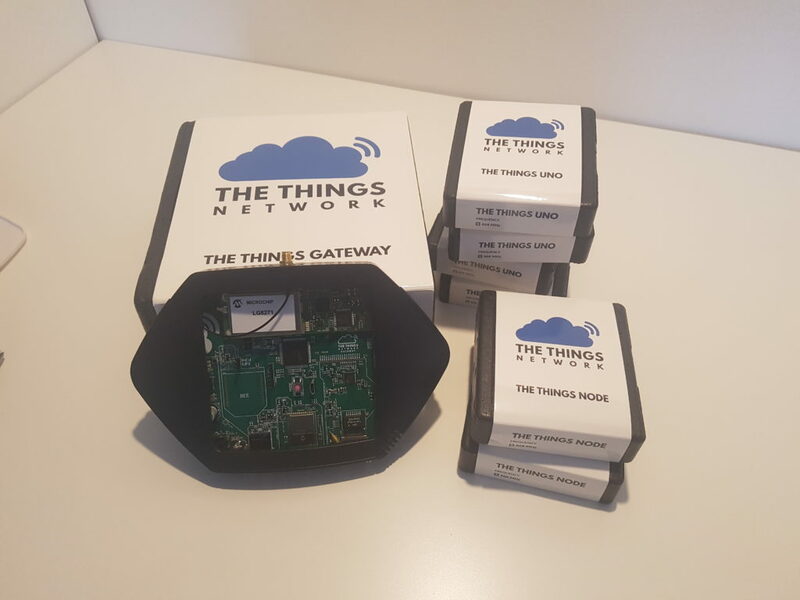 I will be running a The Things Network gateway in the near future (when the Kickstarter project delivers) as well, and helped initiate a LoRaWan/The Things Network group in my previous home city Enschede. Building this sensor-hut is the first foray into exploring how I will use that cheap IoT infrastructure currently emerging in the Netherlands. I am looking to add other sensors, along the lines of what e.g. 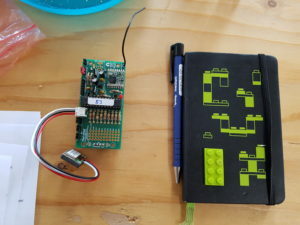 FabLab Barcelona and Waag Society have created with the smart citizen kit, or this project from Freiburg measuring particulate matter in the air. UPDATE: GPS is working now that the sensor is placed outside. Still need to paint it white though. 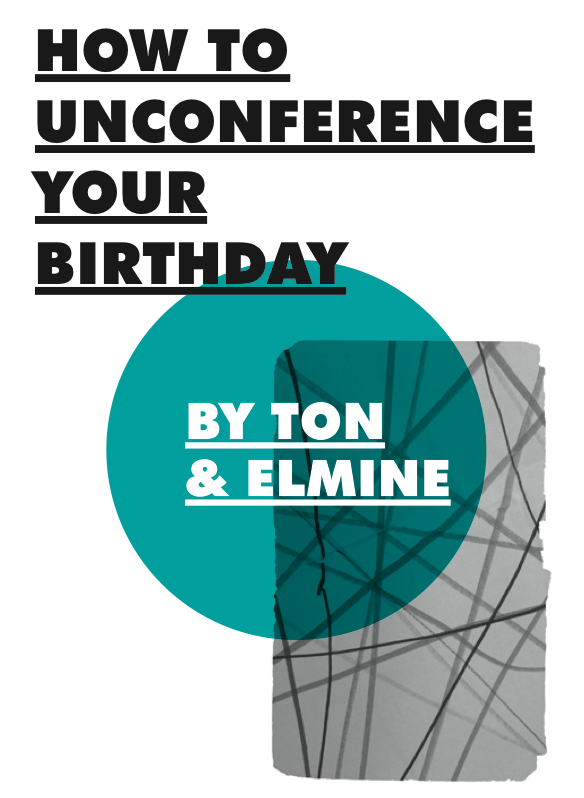 Last Thursday the first TTN Enschede Meet-up was held. 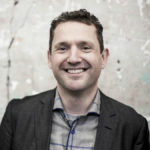 The Things Network (TTN) is an open infrastructure, using LoRaWan, which lets Internet of Things (IoT) devices communicate data to the cloud, from which it can be approached over regular internet connections. What fascinates me in this, is that one can implement a city or region wide infrastructure for very little money, where normally the infrastructure is the expensive part. Especially after the TTN Amsterdam initiators ran a kickstarter campaign offering the gateways for just 200 Euro, last October. With several volunteers here in Enschede, we can quickly achieve city wide coverage, and open it up to all comers. And that is what is indeed happening, as it looks like at least 6 gateways will become available in the city soon. One gateway, which Timothy at Innovalor placed on top of the highrise of the University of Applied Sciences Saxion in the city center, is already operational, since last week. The rest will follow in June. The meeting last Thursday of fifteen TTN and IoT interested people in Enschede was a good first encounter. Besides getting to know eachother, it was good to exchange ideas, experiences, and talk about what we could actually do once the infrastructure is in place. As it turns out, thinking about use cases is not easy, and that will definitely need more thought and discussion. Meanwhile one of the participants, JP, showed his LoRaWan device that measures signal strength of the mentioned gateway. On his mobile phone he combines those measurements with his phone’s GPS location. This way he built a signal strength map of the Saxion gateway while cycling around town over the course of his normal activities. 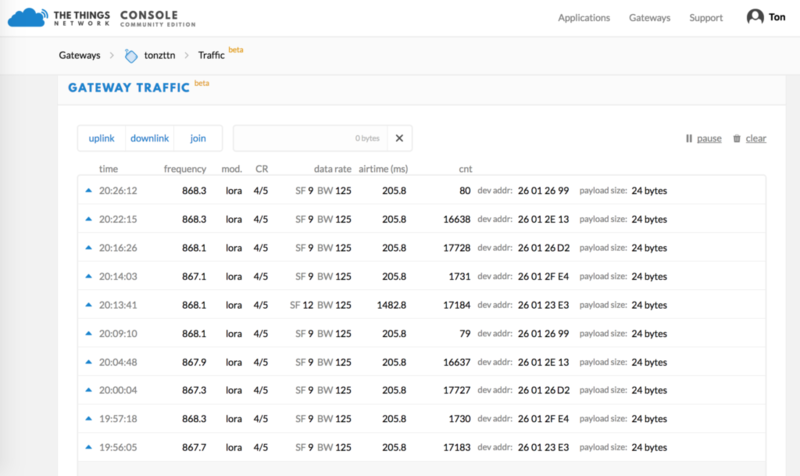 The LoRaWan receiver and the map are shown below. As it turns out more people are currently doing this type of wardriving, trying to crowdsource a coverage map of the Netherlands. 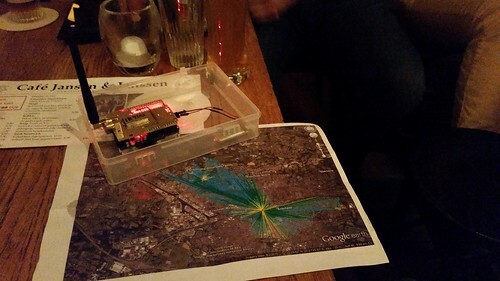 Earlier this year a group of Internet of Things enthusiasts in a month or so launched an open communication infrastructure across the entire city of Amsterdam, enabling anyone to let their IoT devices communicate. Without the need for 4G, Wifi or BT connections, it uses LoRaWan, which allows low bandwith but long range traffic, at low energy usage levels. They call it The Things Network. Currently The Things Network is running a Kickstarter campaign to bring LoRaWan devices into the hands of more people, and thus create IoT infrastructure in more cities. The gateways on offer cost about 20% of what similar devices cost, and this is a great opportunity to implement a solid city wide infrastructure at very low cost. With an old fraternity friend, Ian Kennedy, we are now looking to create such an infrastructure for my hometown Enschede. The Things Network from Soda Content on Vimeo. 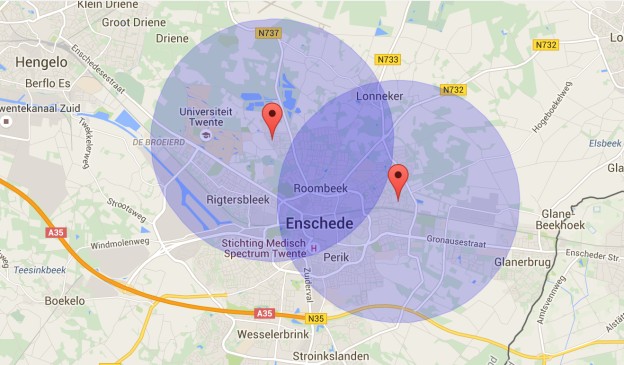 Enschede is a town of about 160.000 people, and covering the city will require 3 or 4 gateways, to which nodes and devices can connect to communicate. Both Ian and I ordered a gateway through the Kickstarter campaign, and are now looking to connect to more people locally with an interest in IoT. Ideally one or two others will also fund a gateway, ensuring city wide coverage. The coverage between the two of us is shown in the image at the top, and as you can see especially the southern suburbs still need coverage. We will likely also reach out to companies and the city government to see who else is interested in experimenting with this new infrastructure. As delivery of the devices is scheduled for late spring next year, still a long time away, we have plenty of time to get the ball rolling before that. Interested in making Enschede IoT ready? Join the newly created mailing list Things Enschede (running on my own mail server), and/or help create the infrastructure by adding hardware through the TheThingsNetwork Kickstarter campaign. We will aim to organize a meet-up in November to get local conversations going. If there are a few others willing to join us, we will certainly add Enschede to the growing list of cities in the The Things Network community. UPDATE: Others are indeed also active, and have been arranging gateways too. That ensures we will have enough hardware to get city wide coverage up and running. Meanwhile a local Enschede community page has been opened, but not yet filled. We make three prototypes for everything. A technical prototype (electronics etc. ), a ‘what it looks like’ prototype (design), a ‘how it works’ prototype (interaction design). 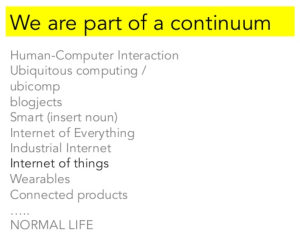 Another element I want to highlight from the ThingsCon opening keynote by Alex Deschamps-Sonsino (Designswarm), is her discussion of what the internet of things (IoT) is and is not. Of course the internet of things, just like any other technology is only a novel and separate subject by itself as long as it is the exception and not mainstream. 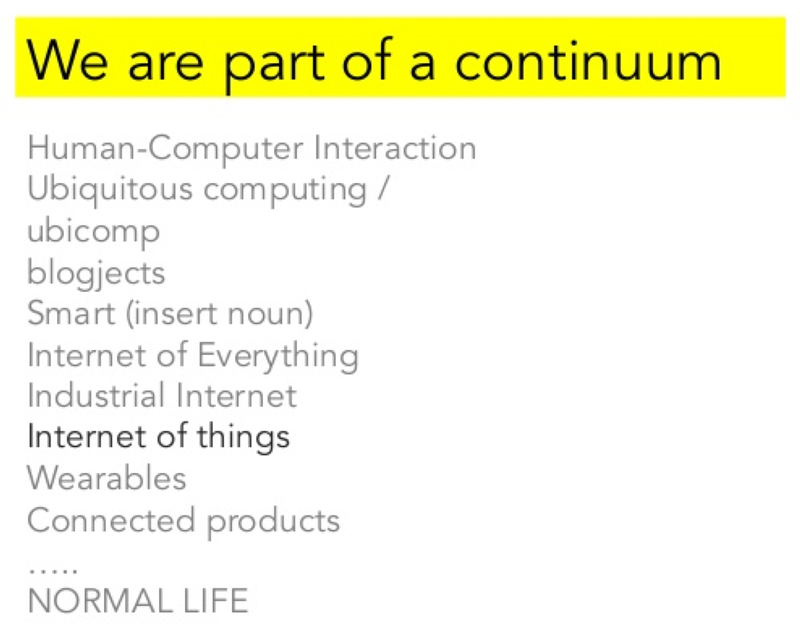 Right now we are simply somewhere on the continuum between early human computer interaction and normal regular life. At the singularity point, or perhaps better, the vanishing point, an everyday object will ‚simply’ be smart, and we’ll just get on with it. This autonomy and smartness in everyday objects where it is relevant, does not equate automation, nor only smartness. It also means playing well with others (objects / interfaces / people, through APIs), and it means being connected to the internet as the underlying substrate, so it can become a grid or platform of objects and can be built upon. 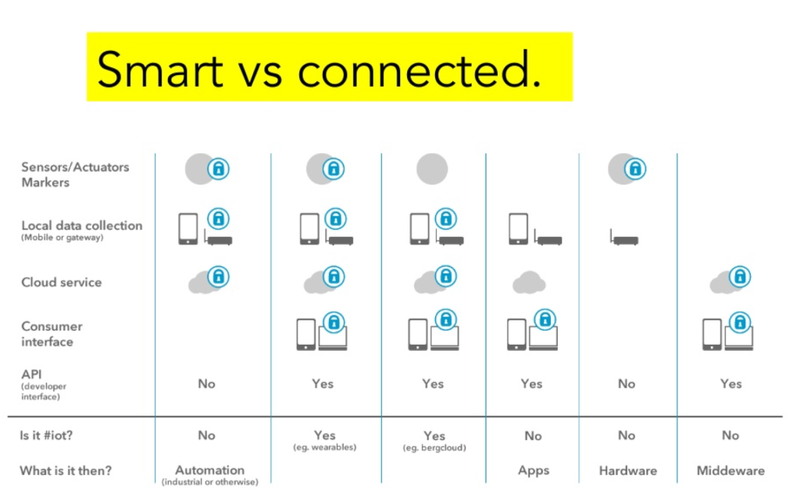 One of the slides is shown below as a handy comparison chart. The deconstruction of the smart fridge is one of things I took away from Alexandra Deschamps-Sonsino’s opening key-note at ThingsCon. I think I have heard versions of the ‚smart fridge’ ever since I first went online 25 years ago, even before the web. Alex presented it as a typical ‚males who never use a kitchen dreaming up a use case for what they imagine (mostly) females do in there’ situation. “It’s not about the fridge!” Unless its power got cut, it needs servicing, is about to break or explode, there’s nothing you need to hear from your fridge. It is about our behavior and the groceries we buy. 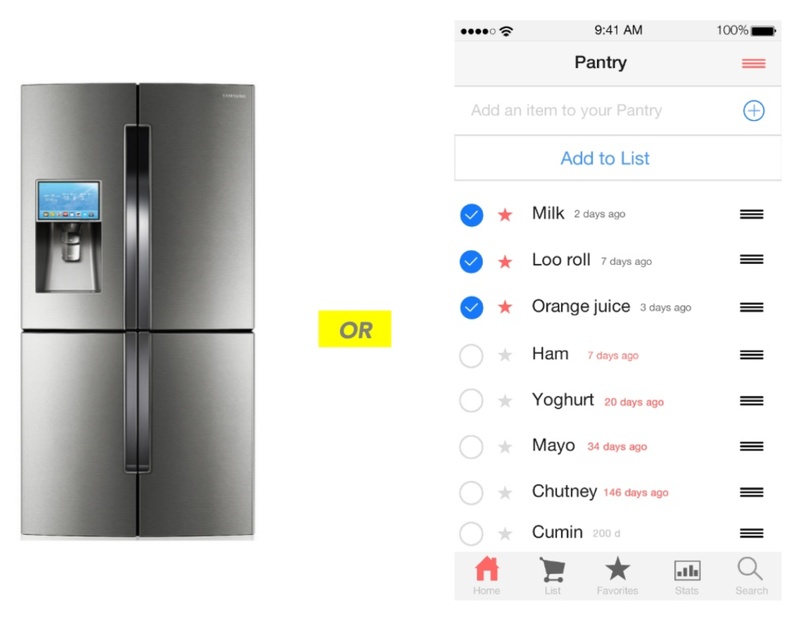 The state of the food in your fridge is of course important, so Alex showed an app she prototyped, Pntry, as alternative that keeps track of when you last bought something. If you last bought milk 200 days ago and it is still sitting in the fridge, better have it removed by a biohazard crew, and not use it anymore. If it was a spice you bought 200 days ago, that’s fine. In his talk later in the day, on a similar note, Matt Webb, discussed the ‚smart’ washing machine they hacked from a regular Zanussi. „We put it on the matrix, it still thinks it is a normal washing machine.” They added a button you press when you are about to run out of detergent etc. It only puts it on your normal shopping list, as it is at the washing machine you notice if you’re about to run out of detergent. Again it isn’t about the machine but your surrounding flow of behavior. Unsurprisingly at Re:Publica, Germany’s largest annual gathering of internet techies, the smart fridge reared its ugly head this morning. This one was dreamt up to tweet its power usage to compare it with others of similar type. Not that tweeting that info is a good way to gather data, nor is adding more power consumption to measure the same. Alexandra Deschamps-Sonsino gave the opening key-note at ThingsCon, in her usual thought provoking way backed up by conviction and active experience. There is much to take home from her presentation and resulting discussion in general, but much more so in particular which I will do in a few separate postings, to be able to connect it to other thoughts and take-aways from the conference. For now, here are the slides to her presentation. Far too little key-notes do what they should: be a kernel for conversation and interaction, while otherwise not getting in the way of the same. This keynote was exactly fit for purpose.